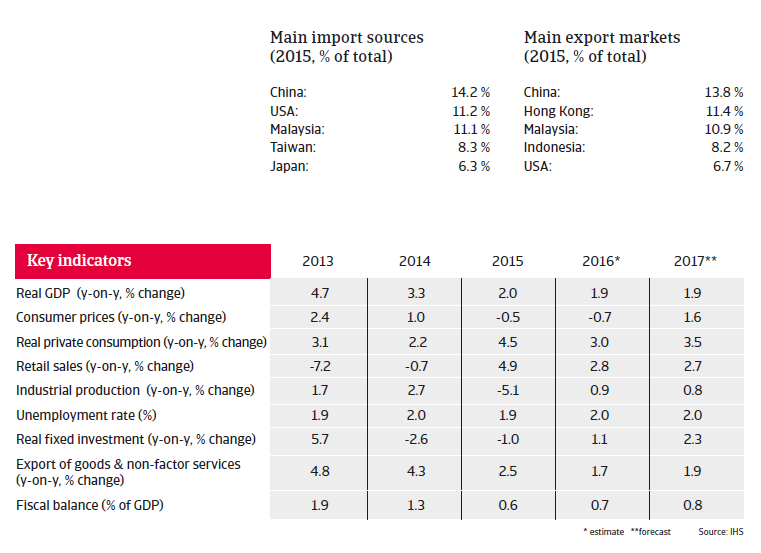 In 2017 the economic performance continues to be impacted by weaker demand from China and other Asian countries, but strong fundamentals remain. The People’s Action Party (PAP) has been in power since Singapore’s independence in 1965. The PAP is business-friendly but, compared to Western standards, personal freedoms are limited. The opposition is weak and fragmented and has very few opportunities to present itself in public. In the last general elections held in September 2015 the PAP won nearly 70% of the votes, securing 83 of the 89 seats in parliament. Singapore’s income per capita and level of development meet OECD standards. This city state is the main transport and financial service hub for Southeast Asia, but its economy is somewhat vulnerable because of its high reliance on demand from its trading partners and the focus on certain specific sectors such as electronics and pharmaceuticals. Nevertheless, for a small state the economy is relatively well diversified. Singapore’s banking sector is healthy and adequately supervised. The city state´s long-term growth strategy is to move away from being just a trade, transport and financial hub and to become a centre of high-tech industry. This strategy is starting to bear fruit in the bio-medical sector. 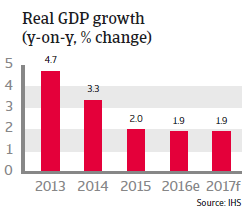 Singapore’s economic growth is expected to remain subdued in 2017, due to continued weaker demand from China and other Asian countries. 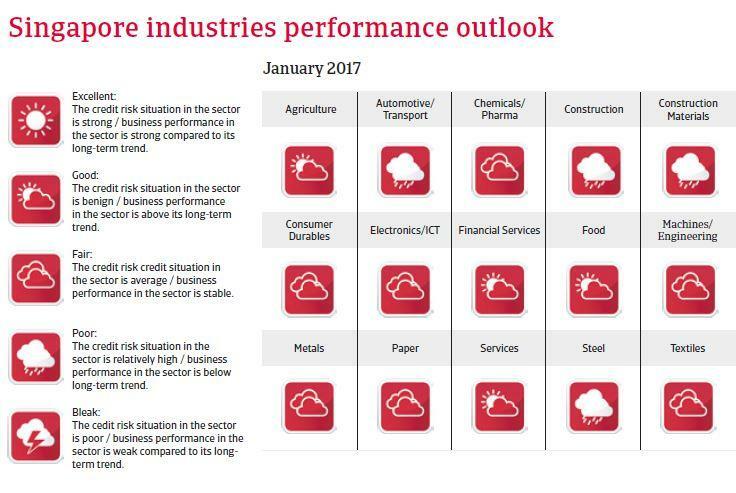 Mainly affected are manufacturing, the oil and gas industry and the services sector. Private consumption and investment growth are expected to increase in 2017, sustaining the economic performance. The city state continues to be one of the strongest countries in the world in terms of sovereign risk and macroeconomic fundamentals. Therefore, and due to the ample foreign exchange reserves and adequate monetary management of the Singapore Monetary Authority, the exchange rate is unlikely to be affected by changing patterns of international investment. 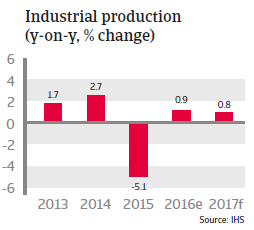 However, due to its high dependency on international trade Singapore is very susceptible to risks stemming from a hard landing of the Chinese economy and any protectionist measures taken by the new US government in its trade policy towards Asia. Despite no variation in either domestic or foreign late payment rates, the average 46 days DSO recorded in Singapore is six days longer than last year.